Twitter (TWTR) is an online social networking service that enables users to send and read short 140-character messages called "tweets". The social media site is looking to introduce a payment service to its growing number of features designed to make Twitter users’ life easier and better. A MasterCard top executive said that Silicon Valley companies often make good partners as these social media juggernauts have been adding successful payment services over the last few years. “I think the way we would work with them is just the way we work with the other tech giants, we would figure out what we can do together, where our network could play into their space and connect up,” he added. Twitter will be following in Facebook‘s (NASDAQ:FB) footsteps as Zuckerberg’s network added a peer-to-peer money transfer service via its Messenger app last year. Master Card added that it may also join forces with Facebook soon. TWTR stock is up 6.8% Monday. MA stock is down 1.1%. HumbleInvestor and T0rm3nted like this. The National Football League has chosen Twitter as its exclusive global partner for streaming its Thursday night games during the 2016 regular season, the parties said on Tuesday, a deal that could help the social media site expand its user base. CBS Corp (CBS.N) and Comcast Corp (CMCSA.O) unit NBC, which won the broadcast rights in February, could also gain more viewers via Twitter, TV executives said. Twitter Inc (TWTR.N) spokesman Brian Poliakoff declined to disclose the financial terms, or elaborate on how the games would be streamed. But technology news website Re/code, citing people familiar with the bidding process, reported that Twitter paid less than $10 million for the streaming rights. The deal comes as sports fans are increasingly relying on the Internet to watch video at the expense of traditional cable and satellite connections. Livestreaming the games would give Twitter a new avenue to attract users as it tries to catch up with rival social networks like Facebook Inc (FB.O), which has over a billion users. The NFL partnership helps cement Twitter's position as a destination for live video, said Tom Richardson, president of consulting firm Convergence Sports & Media. "I don't think it's going to cannibalize viewership at all," CBS Sports Chair Sean McManus said. "I don't see people turning off their televisions and watching the game on Twitter." "The fact that our national commercials are running on the Twitter feed is a big benefit," he said. An NBC spokesman declined to comment. Twitter will livestream 10 games for free to the more than 800 million people who use its service, as well as non-registered users. Twitter Chief Executive Jack Dorsey said users would be able to watch the games "right on Twitter." Under the deal, Twitter can sell local ads off the games, but national ads, which make up about 85 percent of the spots during the games, will be sold by CBS and NBC. Twitter outbid a number of companies, including Verizon Communications Inc (VZ.N), Yahoo Inc (YHOO.O) and Amazon.com Inc (AMZN.O) to win the deal, according to Bloomberg, which first reported the news. Facebook Inc (FB.O) dropped out of the bidding last week, the report said. Facebook, Yahoo, Verizon and Amazon did not respond to requests for comment. Twitter's stock hit an all-time low in February after the company said its user growth stalled for the first time since it went public in 2013. As of Tuesday's close of $17.05, the stock had fallen 26 percent this year. people familiar with the bidding process, reported that Twitter paid less than $10 million for the streaming rights. Seems like a good deal, but this wont save this crappy stock from sinking! Twitter Inc named PepsiCo Inc Chief Financial Officer Hugh Johnston and Martha Lane Fox, co-founder of travel website lastminute.com, to its board on Friday in its latest management shakeup. The appointments, which take effect immediately, came as board members Peter Currie and Peter Chernin decided not to stand for re-election, Twitter said in a regulatory filing. The terms of Currie, the president of a private investment firm, and Chernin, a Hollywood executive, are set to expire at the company's annual meeting in May. Twitter Chief Executive Officer Jack Dorsey tweeted that other directors would be appointed soon, "ones that will bring diversity and represent the strong communities on Twitter. This matters & is a must." Twitter has tried to freshen its board since January as it has been criticized for lacking diversity and innovative ideas. Many of its 10 board members have served for several years. "You need greater turnover than just these two and ideally bring in some media figures," said Monness, Crespi, Hardt & Co analyst James Cakmak. "Almost everybody needs to turn over, and these two are just a start." Shares of Twitter were down 2.5 percent in early afternoon trading. The microblogging site has faced myriad problems over the past year, including a prolonged CEO search before it appointed Dorsey permanently in October. In January, four top executives left the company shortly before it reported quarterly earnings in February, when it said it had no growth in users for the first time since it went public. TWTR Has over $3.5 billion in cash according to financials and $1.6 Billion of debt. A healthy ratio. TWTR will be over 20$ by the end of the week, I saw some insider TYPE info, and I am telling you its looking good. 10-Q will be AWESOME!!! Pretty tight range on TWTR and earnings out after the close tomorrow. The way this is lining up, yeah, its going to make a good +10% one way or the other! The short sellers, who now control 10% of outstanding Twitter shares, have gotten more bold and comfortable about their position. 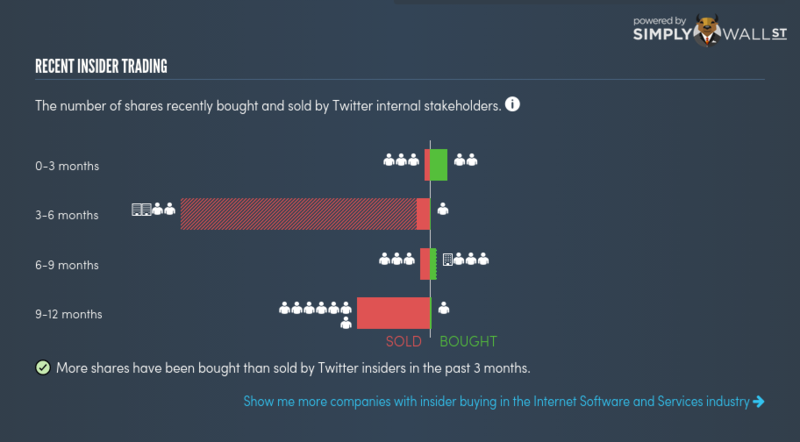 With the options market pricing in about a 13% move up or down on Twitter on the earnings results, this presents a compelling opportunity to play contrarian and buy Twitter stock now. Why? All of the bad news about the company is likely out. And it's hard to imagine there's another shoe to drop. Anyone who's wanted to sell their shares has likely already done so when the stock reached its 52-week low of $13.91 in February. A 13% move upward would put the stock at around $19.50. If it breaks $20 on a beat and raise, good luck catching it. Im going to take a small shot at it, May 18 calls .89, here we come! blypelako and Allegiance like this. Well, at least someone is still hyoed about Twitter haha. I hate TWTR, which is why I fight my initial impulse ! Hmm, Im not sure if this rally into earnings should have me concerned! Thats some Costanza strategizing there! -9% down. Sounds like guidance is bad. Dorsey should just stop trying. Well that did not work out as intended! And by stopping to try, the opposite will happen!